One of the most common questions I get asked when people learn I review cars is, “What car or truck should I get for my family?” Now, as many of you know, I’m single and without children, so I can’t tell you whether or not it’s easy to change a diaper on the tailgate or put in a child seat. Honestly, I wouldn’t even know where to start but that’s what YouTube is for. What I can say is that the 2017 Acura MDX SH might be one of the best SUV’s I’ve ever driven. This SUV received a 5-star safety rating, which means your family will always be safe. The MDX is also backed by Honda, one of the largest and most reliable automotive manufacturing companies in the world. So, not only will you make it where you need to go, but you’ll never have a problem getting the service and support you need. 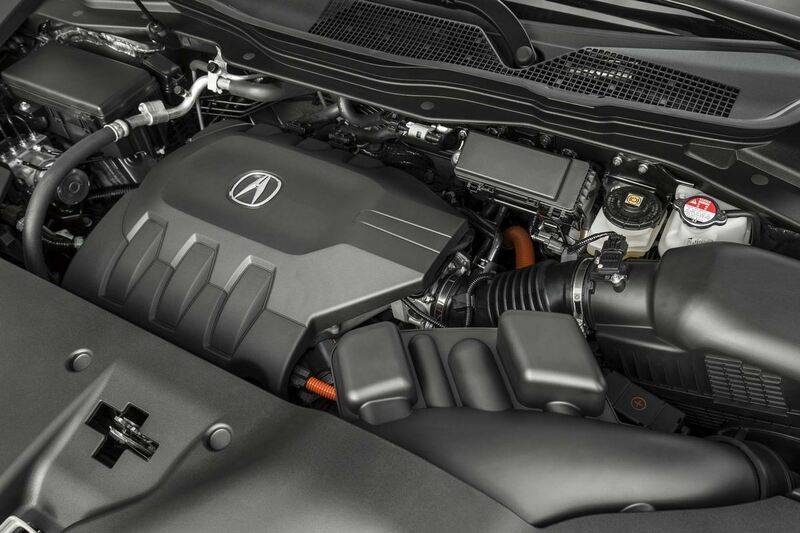 But, what is it that makes the Acura MDX Sport Hybrid so special compared to everything else on the market? Acura has really pushed the envelope when it comes to styling. Ever since the brand started, Acura has aspired to be their own brand. And why not – Acura needed to stand out from its Honda brethren. But more than that, Acura was looking to attract business from the German and high-end market at the same time. In my opinion, that is exactly what they did. Now, I do realize that Acura’s major competitor in this market is Lexus, but Acura showed up first, and did they ever run with it. 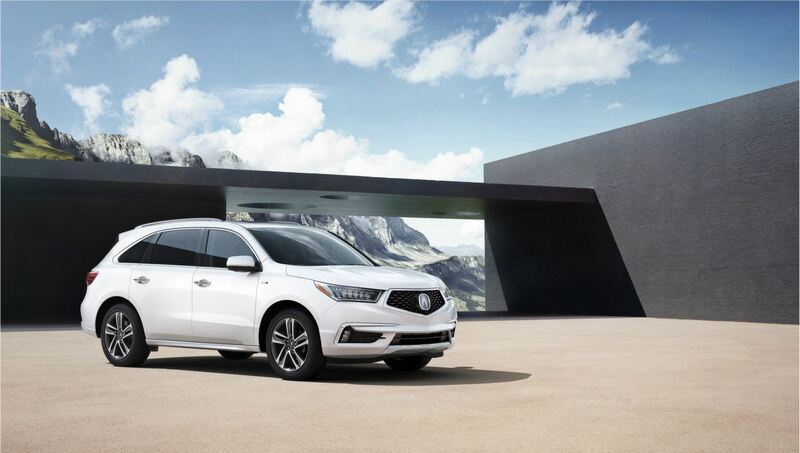 Everything about the MDX just oozes class. The MDX Hybrid I was testing was black on black; I couldn’t help but stare every time I walked away. It felt like I was rolling up in a Mercedes G class, even though it’s a Honda in a Tuxedo. Acura pioneered the LED light market with their multi LED headlight design. Like looking at a diamond studded watch, you can’t help but stare, it just grabs your attention. The sharp body lines, sleek styling, and 20” wheels really complete the package. 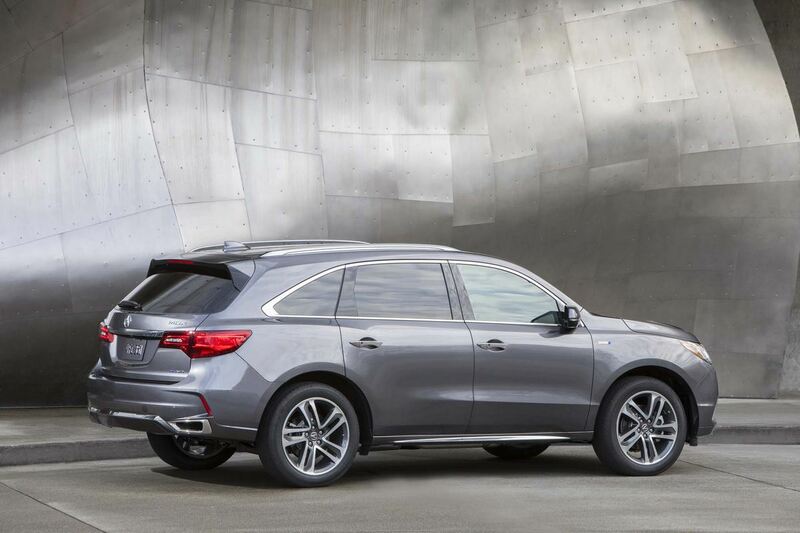 To be honest, the only thing I don’t like about the MDX is those silly fake exhaust tips built into the bumper. I know most brands are switching to this style and I still don’t know why. They’re as bad as putting fake covers on your brake calipers so it looks like you have Brembos. Now most of my friends and coworkers looked offended when I mentioned that this MDX was a hybrid and I don’t blame them one bit. Hybrids have come a long way in the last decade or so but most still leave a lot to be desired. Typically, the transition from gasoline to battery isn’t smooth, the small gasoline engine has to work twice as hard because the electric motor can’t keep up with the power demands from the user. I’ve even seen cases where the hybrid gets the same or worse fuel economy than the gasoline equivalent. 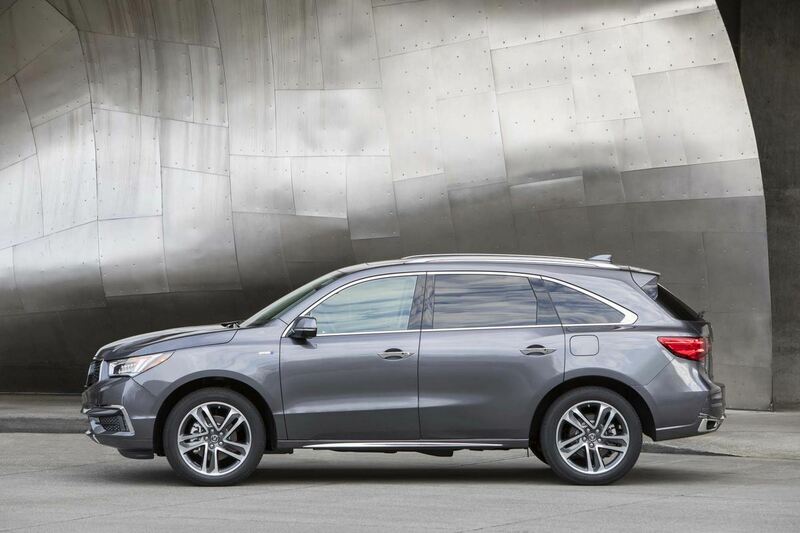 Thankfully, this Acura MDX Sport Hybrid was the complete opposite. I picked up the MDX in Richmond and reset all the fuel indicators. From Richmond, near the auto mall to my office in Port Kells (a 42km trip with stop and go traffic) the MDX averaged an astonishing 5.9L/100km! Full disclosure though; I was purposely driving with economy in mind to see how low I could keep the number. That being said, traffic came to a crawl for a solid 10km due to a stall on the bridge so it’s hard to argue either way. After a week of driving in town and another 500km under my belt, the average came up to a very, very respectable 9.1L/100km. For a seven-seater, full-size SUV, that is pretty amazing. The 3.5L gasoline engine gives plenty of power and sounds fantastic. The all-wheel drive system is faultless and I think a real contender to Audi’s Quattro system. This may be one of the best Hybrid Drive systems I’ve ever driven. 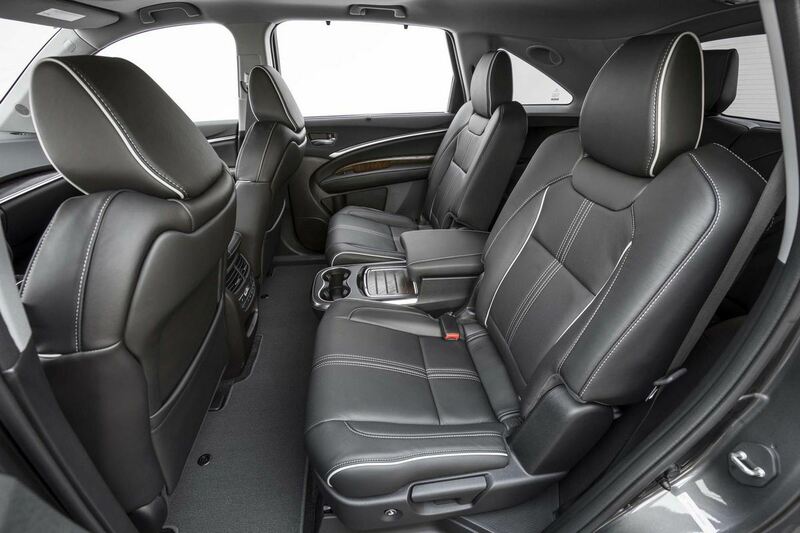 The interior is where the Acura MDX really shines. Beautiful soft leather seats with white stitching and piping look great and are softer than baby wipes. Both front seats are heated and cooled, the rear seats are heated, as is the steering wheel. The dual screen display in the center console is easy to use and the touch pad on the lower screen vibrates when you touch it, like most new smartphones. The dash and cluster are laid out beautifully and the center information screen can be customized to show whatever you’d like. For some reason, Acura is really sticking to their push button style gear selector. It’s not that it’s a bad thing – it’s just really weird, coming from an enthusiast’s point of view. Having a tab for Park, a different shaped button for reverse and a weird lit button for drive doesn’t seem so bad. But when you’re in a parking lot, trying to maneuver into a tight spot, it gets annoying real fast. I’m all for innovation and change, but baby steps! There’s plenty of leg room in the adjustable second row, and a massive TV screen to keep the kids quiet on road trips. The third row is pretty tight, more so than I seem to remember. Getting in and out is a little awkward but it seems that the floor has come up nearly a foot from the previous model. One of my close friends has an older MDX and I know I can fit back there just fine. Now it seems I have to saw my legs off and throw them in the trunk – I guess kids will be okay though. Small price to pay for the fuel savings in a Hybrid (assuming that the space is taken up by the batteries) but if having a comfortable seven-seater is a must, then that may be the breaking point. Trunk space is pretty standard for a seven-seater and the all too common power tailgate works great. I really hope there’s an option to turn the one million decibel beeper off when you activate it though. Nothing like going to put groceries away and scaring the person in the stall next to you at Superstore… With the seats folded down there is more than enough trunk space and to be honest, if I ever needed a people carrier, I’d just get the five-seater. Back to the original question: “What car or truck should I get for my family?” Each person has different needs, must haves and tastes, but that’s why we have so many automotive brands to choose from. I’ve driven enough cars and trucks to be able to give most people a fairly decent idea on what vehicles would work best in their situation. I know I don’t have the family experience a lot of people do, but I do have plenty of friends and family that do. I absolutely love the MDX but I wanted a family man’s opinion. One of my closest friends bought a new MDX in 2014 when he had his daughter. Now he just had a son, and he said he couldn’t imagine buying anything else.